Save the setting in Fiery Impose templates to automate future jobs. 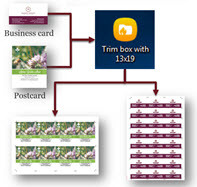 Use the new Based on Trim Box finish size for gangup imposition templates and let Fiery Impose calculate the best orientation and number of repetitions on the fly, considering the desired media size to print on. Drastically reduce the number of gangup templates to manage, with only one imposition template per sheet size for gangup jobs. Automatically detect and rotate pages in a job to ensure that all pages have the same orientation. 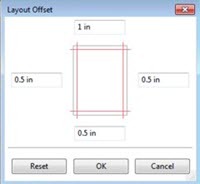 You can also include the rotation requirements in a Fiery Impose template, and apply it to automation workflows. Save your preferred mark settings as presets on a client machine and reuse it for future jobs. Having the ability to reuse mark settings with one click will help you speed up their imposition setup. 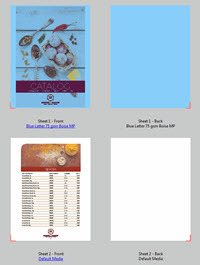 Set media for the covers of VDP booklets that is different than the body pages. Supported in external Fiery servers running Fiery FS150 Pro system software and above. You can preview the color of the media in the Sheet View pane, for a visual confirmation of the media selection and a reference for fast media identification in long documents. This feature provides a new way to specify where to insert the selected page(s) in addition to drag and drop. So, inserting a page into an exact location in a hundred-page document becomes a breeze.